A change in this chalet’s water supply meant their primary hydro power energy source became intermittent. The diesel generator – intended only as a backup – now becoming the sole energy source in the summer months, after the winter snow meltwater had gone. The silence of the place disappeared, diesel emissions polluted the air and the costs for the owners rose. What to do, who to call? Victron dealer and installer Elektro-Mechanik Meisl GmbH came to the rescue. More of that in a moment – but first a little about Konstanzer Hütte. 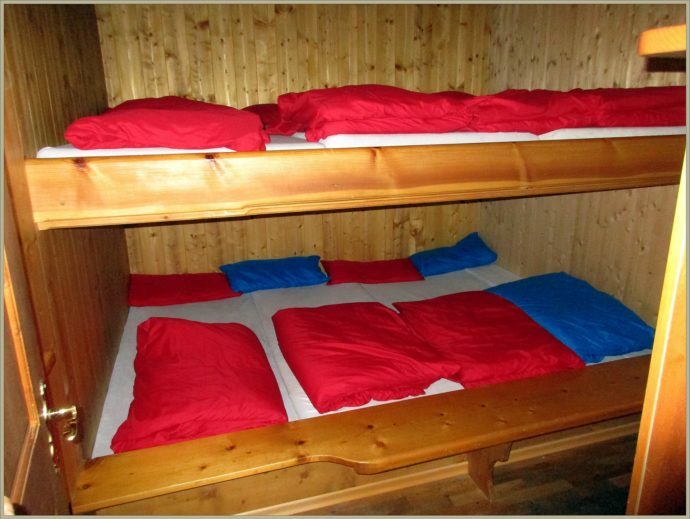 Konstanzer Hütte is a German Alpine Club (DAV) off-grid chalet in the very heart of Europe, amongst the Tyrol, Austria. Due to its remote location there is no public grid electricity supply. 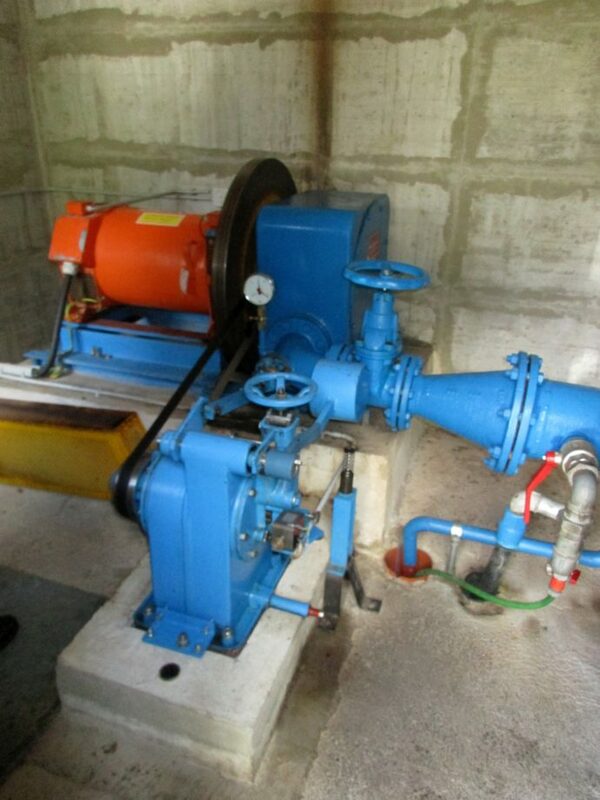 15 kW hydro generator – summer power demand higher than it could supply. Konstanzer Hütte is 1,688m above sea level. 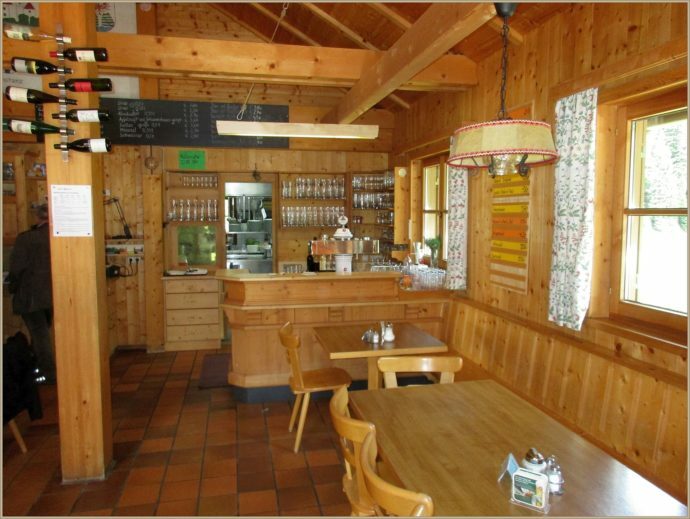 A traditional mountain refuge with gemütlich (pleasant and cheerful) accommodation for 90 guests. A popular stop for hikers following the Verwall trails (about 178 trails) around the St.Anton/Arlberg region. After last summer’s intermittent hydro power and extended diesel generator running, the chalet owners made the decision to seek a more reliable and quieter power source. 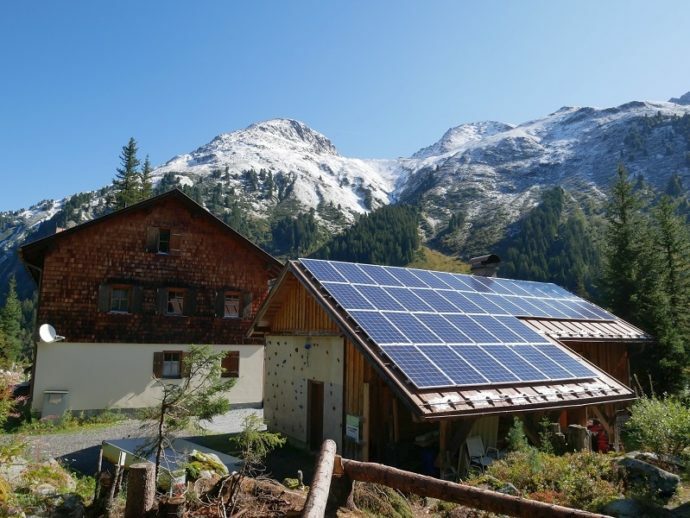 Victron Energy dealer Elektro-Mechanik Meisl were chosen to realise the project, based on their 20 plus years experience in off-grid system integration. Production and load data were evaluated and a new custom designed system evolved, to serve the varying needs of the chalet. This resulted in a combination of hydro and PV power, together with a large scale lithium battery in a 3-phase Victron Energy inverter system. PV compliments intermittent hydro power. 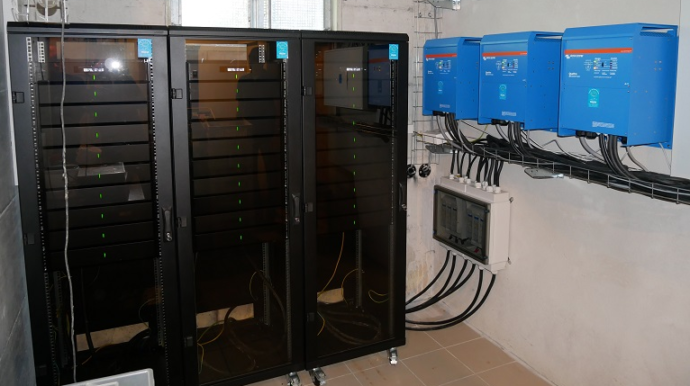 The core of the installation consists of three 48V/10 kVA Quattros and a 32.4 kWh Meisl battery. The pairing of the Quattros and Meisl battery provides enough power for Konstanzer Hütte in any situation. The PV directly powers the loads with any excess energy being used to recharge the batteries. The hydro generator connected to the Quattros now works in its ideal power range. Additional peak demand is covered by the battery and the overload capacity of the Quattros. If more energy than needed is produced, any surplus is used to heat water. The Quattros have therefore been integrated into an efficient energy management system, co-designed by the Meisl company. The battery system uses lithium iron phosphate technology developed by Sony which is characterised by unique thermal stability, being one of the safest and most durable batteries currently available. As a standard in energy storage under extreme conditions it powers e.g. the German Antarctic research station Gondwana in Terra Nova Bay (74°South). The high cycle stability of the battery system allows it to be charged/discharged more than 8,000 times to 100% DOD without a major capacity reduction. Monitoring and data evaluation in real time is by a Color Control GX and smart1 display, the screens of which have been combined into the composite image below. Comprehensive monitoring & management. – click to enlarge image. The composite image above includes the smart1 display showing management of the heating elements, the electrical heating devices in the bathrooms and the staff rooms – which is surplus energy from hydro or PV power. 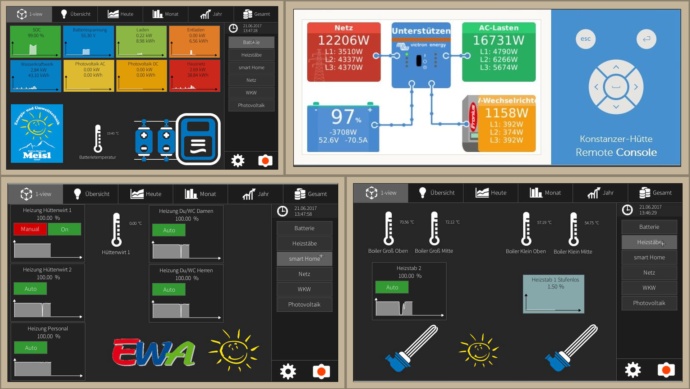 Not forgetting of course the Victron Color Control GX for local and remote monitoring/management too. In conclusion the diesel generator now has a quiet life, only once in a while is it switched on to check its function for emergency purposes. 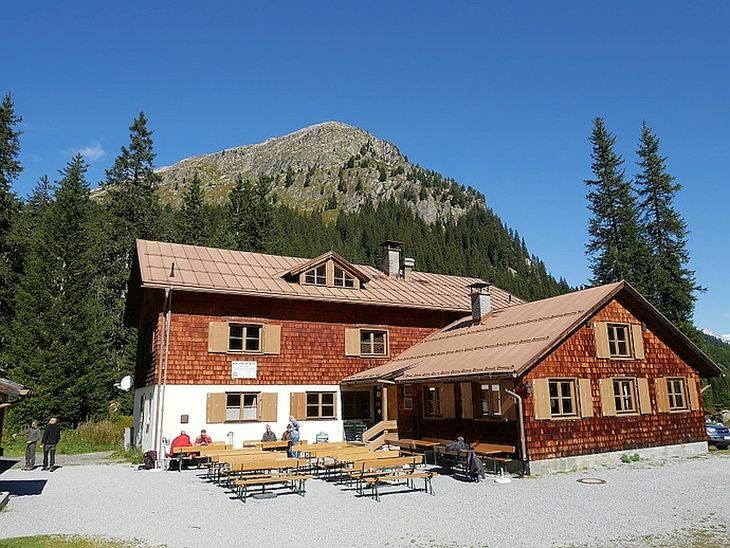 The rest of time the guests of Konstanzer Hütte enjoy the fresh air, peace and a tremendous alpine panorama on the large terrace – without even realising where the energy for their delicious food comes from. The way an energy system should be! Our thanks to Agathe and Hubert of Elektro-Mechanik Meisl GmbH for most of the words, information and images used in this blog, also to Bob Hopman of Victron Energy for making us aware of this project in the first place.